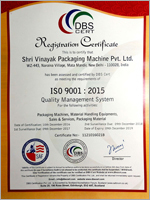 Founded in 2000, we, Shri Vinayak Packaging Machine Pvt. Ltd. stand tall among the leading manufacturers, service providers, traders and suppliers of Packaging Machines and Material Handling Equipment. Our product range embraces Pallet Semi Electric Stacker, Pallet Stacker, Drum Pallet Truck, Hydraulic Hand Table Truck, Dry Ink Batch Coder, High Lift Pallet Truck, Continuous Band Sealer and much more. Our engineers design and manufacture the entire product range in congruence to our patrons' requirements and the global quality standards. Both our machines and equipment are acclaimed for their good tensile strength, excellent loading capacity, low power consumption, wear & tear resistance and affordable prices. Furthermore, we also offer after sales services, as one of the reliable service providers. Al- Ahamed Frozen Foods Ltd.
Pawana Zadi Security Services Ltd.